If you're installing Python3.5 on macOS, you don't need to follow the Automator instructions in Python for Kids any more. After installation, it's as simple as searching for IDLE in Spotlight (the magnifying glass in the top righthand side of the menu bar) and double-clicking on (usually) the top hit ("IDLE - Python 3.5"). Tcl is a simple programming language and Tk is (sort of) a graphics library (more info here http://tldp.org/HOWTO/TclTk-HOWTO-3.html) -- the Tk graphics library is heavily used in later chapters of the book. If you happen to get the above error message, follow the instructions on the python.org website to install the correct version of ActiveTcl for the version of macOS you're running. This post may also be of help. Over the last couple of days I have started using your great book with my two sons (13 and 15 years old). I'm reaching out to you with the following question because I have noticed other people asking about the same issue online, with at least one mentioning your book, so I think you posting the question and answer to your blog might help other people in addition to me and my sons. "WARNING: The version of Tcl/Tk (8.5.9) in use may be unstable. Visit http://www.python.org/download/mac/tcltk/ for current information." I have installed "Mac OS X 64-bit/32-bit Installer (3.3.3) for Mac OS X 10.6 and later" (file: python-3.3.3-macosx10.6.dmg) and installed the "ActiveTcl 8.6.1 for Mac OS X (10.5+, x8664/x86)" (file: ActiveTcl8.6.1.1.297588-macosx10.5-i386-x8664-threaded), but IDLE keeps showing the same error message. Thank you very much for any help you can provide! I'm not convinced ActiveTcl 8.6.1 is the right version to install - I suspect rather than installing the latest and greatest, you should be using version 8.5.15.0. Python (and thus IDLE) will probably be using the latest 8.5 version of Tcl/Tk (i.e. 8.5.x) — you're installing a completely different version (8.6), which it's not looking for at all. Hence even though you think you've re-installed, you'll still be getting the same error message. "The action Run Shell Script encountered an error. Check the action's properties and try running the workflow again"
I installed both versions 32 bit and 64/32 bit and it still didn't work. I'm assuming because I installed 3.3.2, I had to change it to open -a "/Applications/Python 3.3/IDLE.app" --args -n. In other words change Python 3.2 to Python 3.3. Then it worked! Unfortunately I think it was running on the 64/32 version which python mentioned something about ActiveTcl 8.5. It recommended I download 32, so I got rid of 64/32 and re-downloaded 32 bit and it finally gave me no error in the shell. I thought I'd ask if this was an ok thing for me to do? 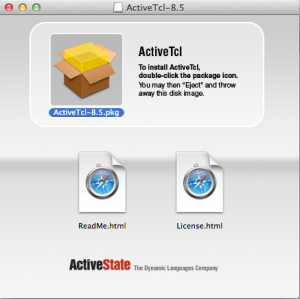 As per the instructions on this page, you'll need to install ActiveTcl in order for IDLE and Tkinter to work properly (both are used heavily in the book) with Mac OS X 10.6. You may need to control-click on the ActiveTcl package, if you double-click and get the error message "ActiveTcl-8.5.pkg can't be opened because it is from an unidentified developer". So if that error message appears, hold down the Control key, click on the icon and select Open from the menu displayed, then click Open on the following screen. Click through the next few screens (you'll be asked to agree to the license and so on), and on the final screen, once you click Install, you'll get promoted for an administrator username & password. Apart from that, your change to the open command is correct, so once ActiveTcl is installed, you should be good to go.